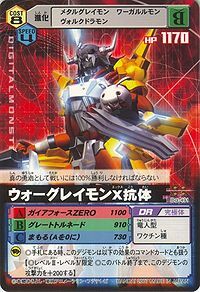 The strongest dragon warrior whose body is clad in armor of the super-metal "Chrome Digizoid", it is the ultimate form of Greymon-species Digimon. 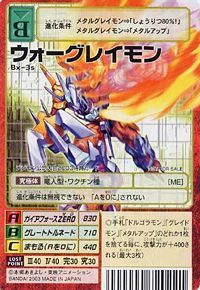 Though it differs from the gigantic figure seen in Greymon-species Digimon, and has the form of a Man-type, it has rapidly improved its speed and power, and it is likely impossible to defeat it with the attacks of a Perfect Digimon. 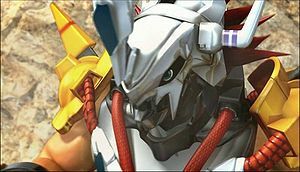 The "Dramon Killers" equipped to both of its arms exhibit immense power against Dramon-type Digimon, while simultaneously being double-edged swords that put its own life at great risk. Also, when the shells equipped on its back unite into one, they become the "Brave Shield", which is a shield of the strongest toughness. It is said that the moment that a true hero among veteran warriors awakens to its own mission, it evolves into War Greymon. Its Special Move is taking all of the energy within the atmosphere and concentrating it into one spot, then firing it as an extremely dense, high-temperature energy shot (Gaia Force). Because of its mission as a true hero, it must have 100% success in battle. It has imparted the strongest toughness of the "Brave Shield" to the "Dramon Killers", leading to it possessing perfected equipment of unified offense and defense. 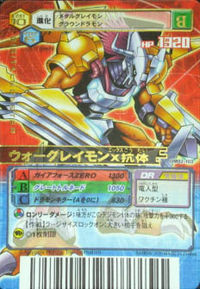 Due to its fighting style, in which it instantly plunges into the heart of the enemy with the vernier it has equipped to its back, which boast explosive acceleration at the expense of it being able to fly for extended periods, it has certainly become the strongest form of land combat Digimon, a "Land War Hero". 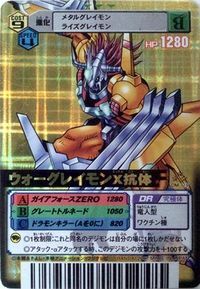 Evasion of its point-blank attack "Gaia Force ZERO", in which it instantly fires its Special Move "Gaia Force" at the heart of the enemy, seems impossible. 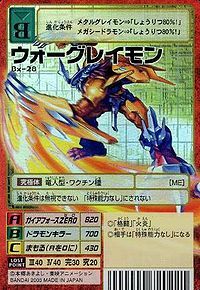 Furthermore, its "Afterburst", which accelerates its attacks with its vernier applied to the "Dramon Killers", is also a one-hit knockout technique. Because of its mission as a true hero, it must have 100% success in battle. Special Move: A point-blank attack that it instantly fires which plunges into the heart of the enemy using the acceleration of the vernier on its back (Gaia Force ZERO). 1) n., Short for warrior 「ウォーリア Wōria」; meaning one who is engaged in or experienced in battle. 2) n., Knowledgeable of the techniques and procedures of war 「ウォー Wō」; military science. v.intr., meaning old or ancient. Physically attacks target with Gaia Force. Uses its vernier to shoot forward and stab the enemy with its Dramon Killers. Condenses surrounding water sources into a hyper-pressurized water sphere. Gaia Force  ガイアフォース Gaia Fōsu Terra Force Concentrates atmospheric energies into a giant molten fireball. 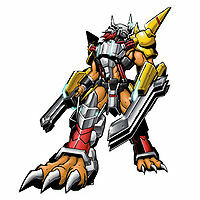 Attacks with Dramon Killer gauntlets; very effective against Dramon-type Digimon. Transforms into a tornado with high-speed topspin and drills the target. Launches a burst of fire forward. 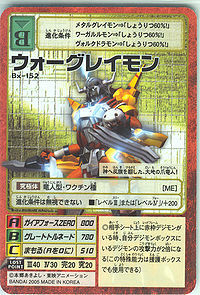 War Greymon X-Antibody is the supposed leader of the X-Antibody Digimon that are fighting against the Royal Knights. 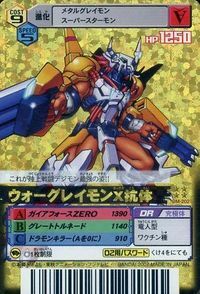 It tries to persuade some non-X-Antibody Digimon that Yggdrasill is their enemy, but when Omegamon appears, War Greymon X-Antibody fights Omegamon but is later forced to flee. During its escape, War Greymon X-Antibody asks DORUmon to watch Tokomon, since it is unable to fight against Omegamon and protect Tokomon at the same time. When War Greymon X-Antibody finally escapes from Omegamon's pursuit, it meets up with Metal Garurumon X-Antibody and tells its friend that the Royal Knights are their enemies. Later, War Greymon X-Antibody has another fight with Omegamon in order to protect DORUmon and Tokomon, during which Metal Garurumon X-Antibody seemingly dies. It later fights against a large number of Death-X-DORUguremon, together with the survived Metal Garurumon X-Antibody along with other Digimon. 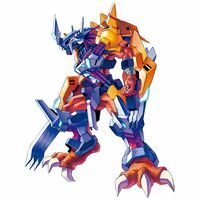 When the crowd of Death-X-DORUguremon nearly deletes the Digital World, War Greymon X-Antibody is among the Digimon which still stands. DORUmon: By finishing the quest Seal the Souls in only 10 minutes in Hard Mode. Agumon: By clearing the quest Undead Yard in Normal Mode. V-mon: By clearing the quest Undead Yard in Hard Mode. Guilmon: By clearing the quest Item Road in Normal Mode. 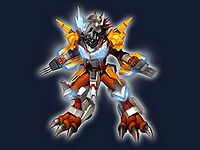 War Greymon X-Antibody is an unlockable evolution of Agumon Galaxy. 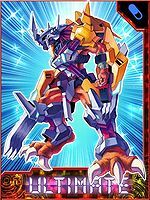 In order to evolve into War Greymon X-Antibody, the optional Agumon Galaxy Digimon must be at level 40, have War Greymon as a evolution, have the X-Antibody, have defeated 250+ Digimon, have used Attack command 200+ times, have used guard command 25+ times, have used escape command 25+ times, and have defeated War Greymon X-Antibody as optional battle. 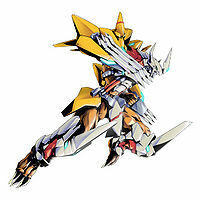 War Greymon X-Antibody is an obtainable Digimon which is evolved from War Greymon using an X-Antibody. It can also be obtained as a collectible card. 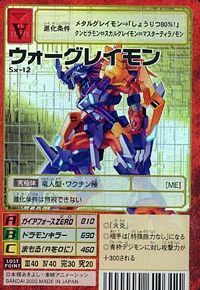 Its card is part of the Two X-Antibodies (２体のX抗体 Nitai no Ekusukoutai) set. 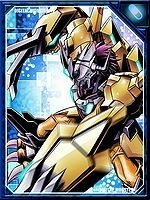 War Greymon X-Antibody is available as a Digimon Medal. 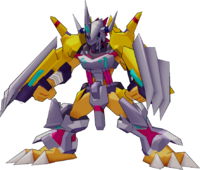 War Greymon X-Antibody evolves from Grademon, Metal Greymon X-Antibody, or Mega Seadramon X-Antibody. 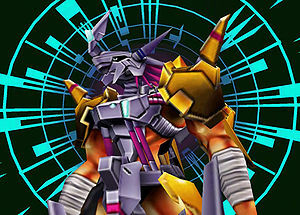 It can evolve to Omegamon X-Antibody. 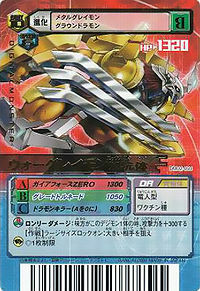 War Greymon X-Antibody evolves from Loader Leomon, Metal Greymon X-Antibody, or Volcdramon. This clawed dragon man of the earth waves the flag of rebellion against God! A true hero must win 100% of their battles. Using all of its strength, it attacks at zero-distance with its Gaia Force ZERO, which is impossible to evade!! 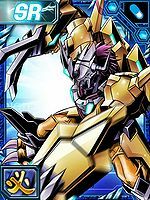 The strongest form of land combat Digimon!! This page was last modified on 20 March 2019, at 13:11.